Hi everyone! It’s Traci, back to share another mini album with you. This time, I used the new Slam Dunk Collection. When the boys were young, they both played basketball, but as they grew up, they didn’t quite grow UP enough (ha ha) so basketball didn’t become their thing. Still, we always had a hoop on our driveway and they enjoyed playing pick-up games with the neighborhood kids. 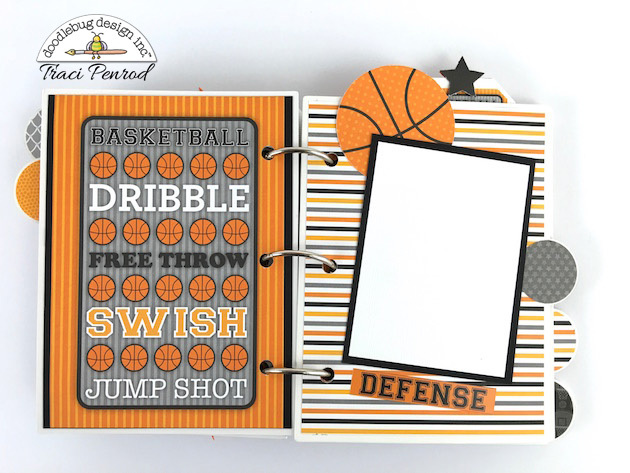 This little album will be perfect for saving all of those fun memories. 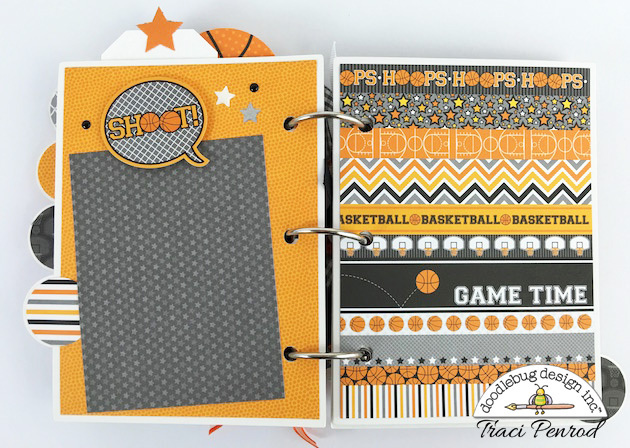 I used one of Doodlebug’s tabbed chipboard mini albums and loaded up the cover with paper from the Slam Dunk 6×6 paper pad. The large circle was cut from the back of a ‘game stripe’ 12×12 sheet. I love the smaller prints in the 6×6 pads, and the little versions of the cut-apart cards are perfect for mini albums. 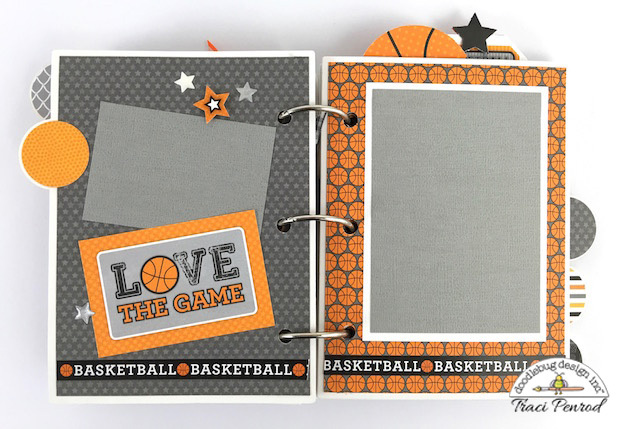 The “Love the Game” piece is a 4×6 card on the 12×12 sheet, but fits perfectly at 2×3 from the smaller paper pad. But don’t ignore the larger 4×6 cards for mini albums! As you can see above, I used one on the left side of this layout by just trimming two of the sides down a bit. 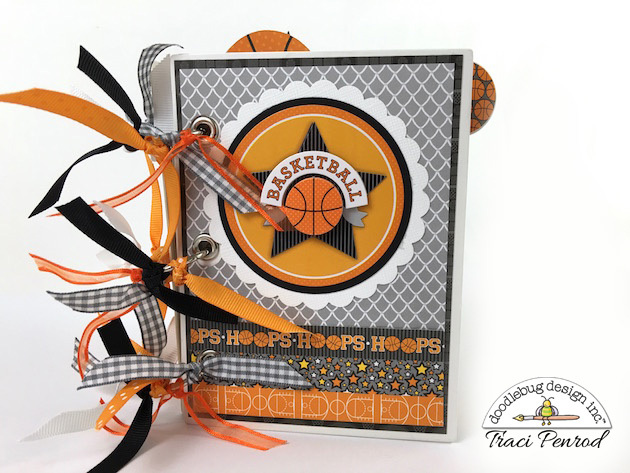 I love the die-cut basketball flying off the top of the album … and although not shown well in this photo, the right side page has a card that flips up to add photos inside. I added a few number stickers to the jersey. Mine represents the year, but it’s even more fun to add your player’s number! Finally, none of my projects are complete without enamel dots and sprinkles. 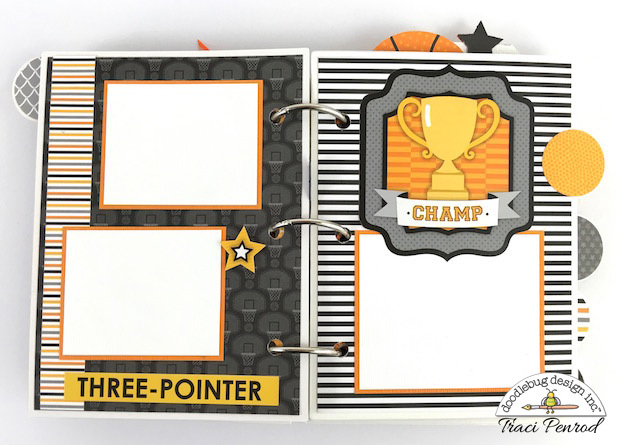 Doodlebug has lots of fun enamel shapes … the stars were perfect for this album. 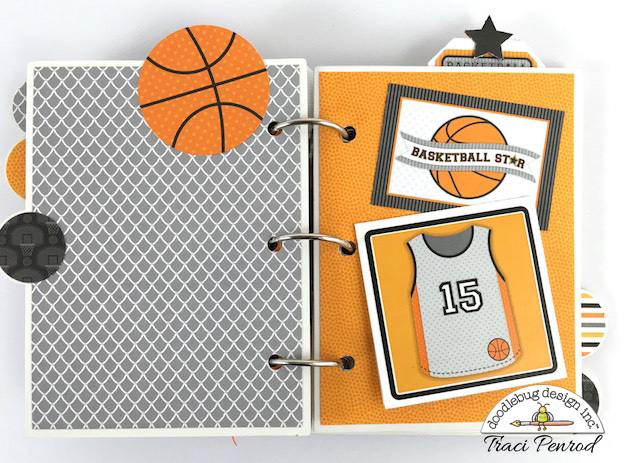 I hope you’ve enjoyed seeing a few pages from my basketball mini! If you’d like to see a few more of the pages, please hop over to my blog at Artsy Albums. Thanks for leaving your comments — I love to read them!